If you like extravagant houses, competition shows and girl drama, we have just the show for you to add to your Netflix queue. It's called Selling Sunset and it's kind of like if The Hills and Million Dollar Listing had a baby. 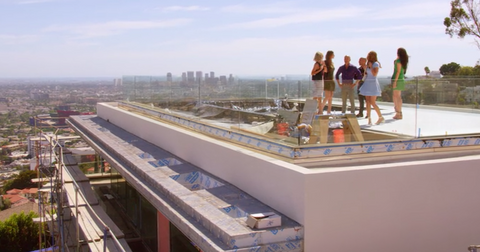 The eight-episode docusoap series centers around the Oppenheim Group, a real estate firm that caters to Los Angeles' most affluent clientele. They buy and sell houses for celebrities like Kris Humphries and Orlando Bloom, and represent CEOs from companies like Halo Ice Cream and Sugar Bear Hair, those dubious gummy bear vitamins the Kardashians get paid to post about. And at the center of their real estate operation are six attractive (if a little plastic) ladies who are responsible for all of the wheeling and dealing behind the scenes. And Selling Sunset fans — as well as anyone familiar with real estate — know the reason the agents are working so hard to impress their Oppenheim bosses Jason and Brett is the hefty commission they're promised after selling a property (we're talking in the hundreds of thousands). 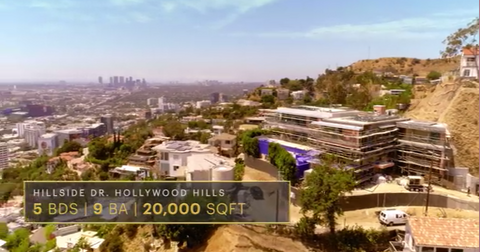 Within the first few episodes, the twins bring the rest of the team to their most coveted $40 million dollar listing, a 20,000 square foot property in Hollywood Hills, which would leave the selling agent with $1.2 million in commission. Take a look inside that famous $40 million house from Selling Sunset. If there's one criticism we have of the show, it's that the Netflix series doesn't do a great job at tying up its storylines at the end. Some catty fights mysteriously fade away without any resolution, it's hard to tell how Mary and Romain leave their relationship, and we're left kind of in the dark regarding Maya Vander and whether she's had her baby. But perhaps most strangely of it all, we never get to see which of the lucky women end up snagging the $1.2 million commission at the end of the show. Which feels extra weird because selling this $40 million listing is, in a way, the goal of the show, which drives every realtor's competitive nature. Perhaps they're saving that information for a rumored second season? Since we couldn't contain our curiosity regarding this gorgeous mansion that boasts five bedrooms and nine bathrooms in a 20,000 square foot space, we did our best to scour all of the Selling Sunset episodes, as well as the Oppenheim Group's listings to give you a glimpse of what the house looks like on the inside and out. 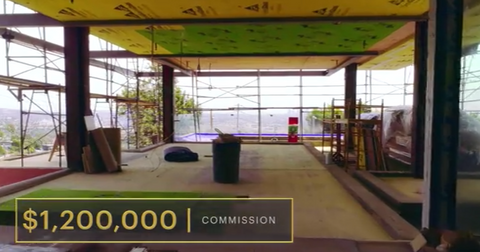 For starters, when Jason and Brett initially take the realtors to see the 8408 Hillside Avenue listing, they mention it's "the biggest house ever built in the Hollywood Hills" as well as the "biggest listing" their agency has ever had. 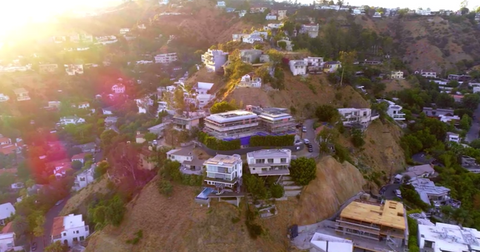 It's also the last home of its size allowed to be built in the Hollywood Hills area, as the Oppenheim brothers mention "the city shut it down," after the construction of this mansion. 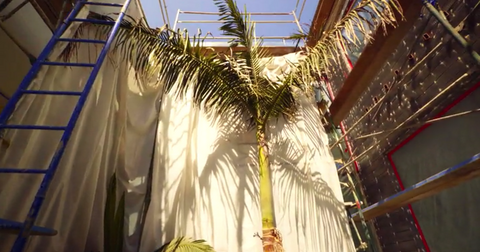 What's inside Selling Sunset's $40 million dollar mansion? 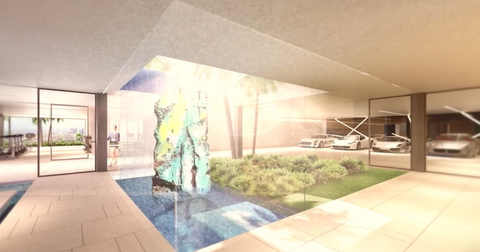 If you're wondering what amenities are available for a cool $40 million bucks, the answer is a lot. In addition to the five bedrooms and nine baths (it seems like they've actually had to pare that down to 8 bathrooms, per the O Group's on-site listing), this extravagant property boasts a 15-car garage, four hot tubs and a 150-foot pool. And we're just getting started. 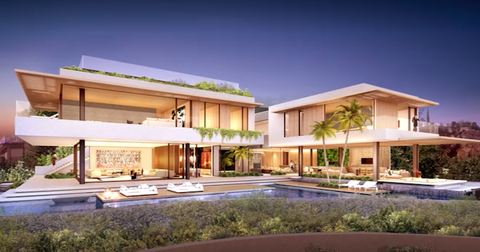 It also has a full gym, two saunas (because why not), a movie theater, an atrium with a palm tree, and a 16-foot television that drops from the ceiling to be enjoyed from the master bedroom. As the Oppenheim twins mention, "there's nothing humble about this." The previous owner doesn't want any new buyer to be disturbed by the power lines you might struggle to make out from the aerial photos, so they're spending half a million dollars to drop them before a new tenant moves in. 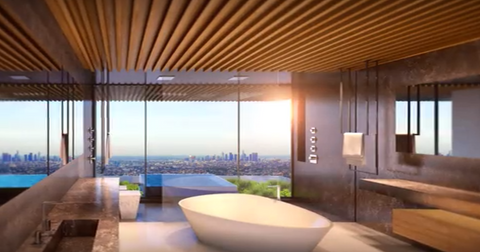 That way, the lucky new owner of this Hollywood Hills mansion will be able to enjoy unobstructed views from the 4,000-foot rooftop deck (an elevator takes you there, of course). Is the Hollywood Hills listing still up for sale? 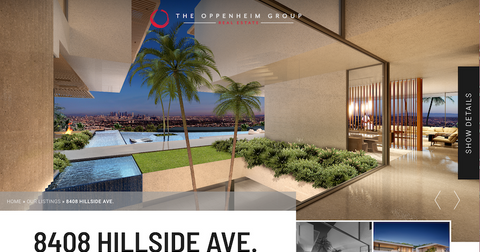 It took us some digging to find this property on the Oppenheim Group's website. We're not sure if that's because they're choosing to showcase newer listings on their front page or because the Selling Sunset listing has proven tougher than they'd initially imagined to sell. All we can tell from the O Group's listing is that they've downsized from the nine bathrooms they were touting during filming to eight, and that they're not showing the listing's current price. "Contemporary architectural masterpiece available in early 2019," their site copy simply reads. We wonder if that means they've been forced to drop their listing price from $40 million to something slightly more affordable, because the Google Earth imagery for this address still shows an under-construction lot, rather than a jaw-dropping palatial house like in the rendered images. Which is to say, if you have around $20 or $30 million burning a hole in your pocket, we think the Oppenheim brothers might be willing to bring down their prices to welcome you into your new Hollywood Hills home. 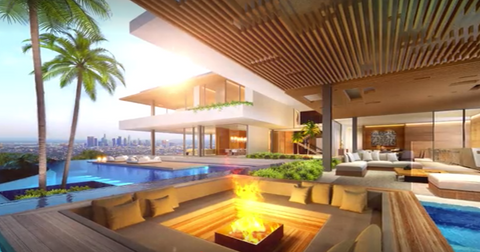 To see inside more gorgeous Los Angeles mansions, stream Selling Sunset on Netflix.